Most Starbucks are architecturally rather cookie cutter and bland. But the popular chain of coffee shops does have a handful of locations with a cool edge to them. Perhaps none more than the company’s drive-thru located in outside of Seattle in Tukwila, Washington. The Starbucks there is built out of used shipping containers! Since Spot Cool Stuff’s first post about shipping container architecture, use of the eco-friendly building material has grown hugely in popularity. Sadly, it hasn’t grown as quickly as the surplus supply of used containers. But nearly every day work begins on at least one new shipping container house or office building somewhere on the planet. 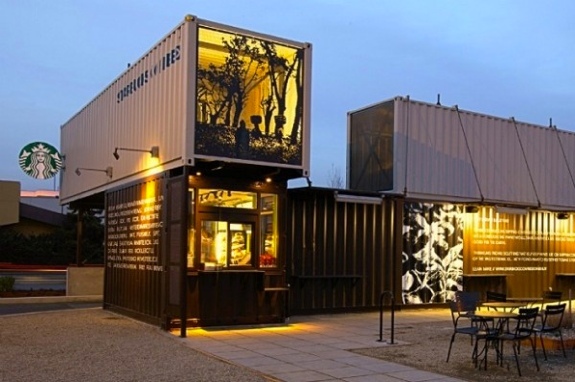 The so-called “Shipping Container Starbucks” does not have a public indoor area. That’s because the four shipping containers used in the construction provide only 450 square feet (42 sq. m) of interior space—enough for an employee work area, two restrooms and a few Frappuccino machines. There is a walk-up window for those who want to park and hang around the outdoor seating. In addition to the use of the shipping containers, the Tukwila Starbucks incorporates other green building practices. Foremost among them: a rooftop rain collection system which gathers water to use for landscaping. To be clear, the Shipping Container Starbucks is not so spectacular to visit that we’d suggest a special trip to see it. But if you are in the area, or find yourself approaching exit 156 off the I5 highway, we think it is worth making a little detour to check it out—if for no other reason than to get a shipping container-tinged caffeine fix.